The new mid-century modern furnishings by Currey & Company prove that jet-set style never fully wanes. The allure of mid-century modern may have ebbed and flowed over the last several decades but these tenacious styles are enjoying a full blown tidal wave of popularity right now. The mid-century aesthetic features bold, angular and sometimes stark lines and incorporates the punchy, dramatic, and even quirky fashions of the 50’s and 60’s. 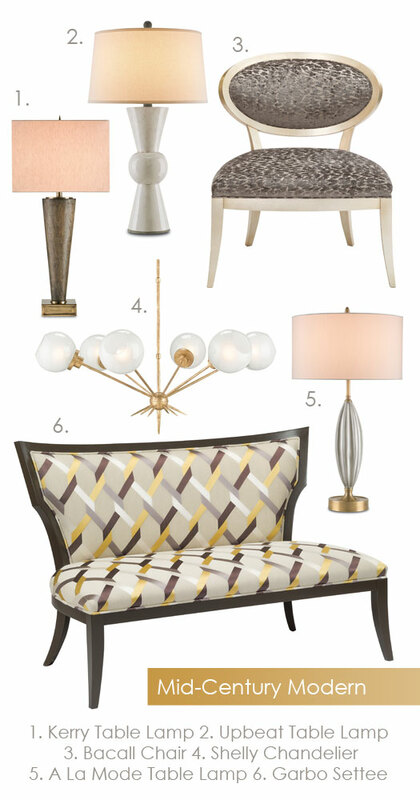 Currey & Company’s line features many products that evoke that mid-century vibe, whether in our lamps and lighting, custom upholstery or furniture collections, we haven’t missed the boat on this fabulous trend. The next time you want to add jet-set style to your interiors, we offer a number of advantages over other manufacturers. Currey & Company’s approach includes hand finishing techniques and more natural materials than were used in the 50’s, 60’s and 70’s, when synthetics and the use of man-made materials was on the rise. Our use of softer, hand-applied finishes and natural fabrics give the sharp silhouettes a more comfortable appearance than the originals. This entry was posted in Currey & Company, Products and tagged Chandeliers, design trends, Gold, Lighting, Mid-Century, Modern, seating, Table Lamp on November 18, 2014 by Currey & Company.